If there is one part of the Washington State that stands out in this spectacularly beautiful part of the country, it is its islands. Covered with old forests mixed with rolling fertile hills, circled by miles of sandy beaches, and with views of the surrounding mountains, the Washington State islands are hidden jewels. Some, linked to the mainland with bridges like Mercer, are a suburb of Seattle. Fairly close to Seattle, many islands are an escape for the busy and affluent from the stress of life. 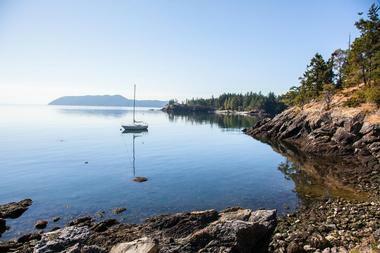 Orcas Island is the largest of the San Juan Islands, located in the northwestern Washington state. At the northern end of the island is the village of Eastsound, the largest of several quaint villages and hamlets on the island. 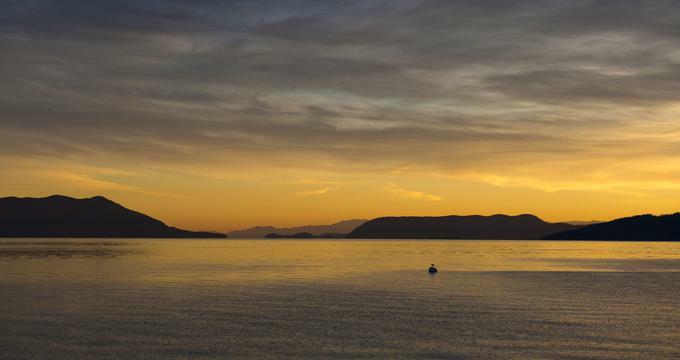 “The gem of the San Juans,” as the locals call Orcas, is a thrilling mix of magnificent shoreline, 2,409-foot-tall Mount Constitution, fertile rolling hills, dense forests with waterfalls, and endless ocean stretching to the horizon. The island is fantastic to explore on a bike or on foot, along good, curving country roads that pass by ancient apple barns, artists’ studios, and small villages. Constitution Mountain is part of the 5,252-acre Moran State Park, with several clear blue lakes and over 38 miles of hiking trails. Hike up the mountain to enjoy the breathtaking view of snow-capped Mount Baker and the island-dotted sea. 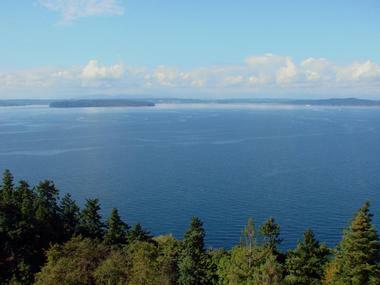 San Juan Island is located in northwestern Washington and is the second-largest of the San Juan Islands. The island is connected to the mainland by Washington State Ferries, which dock at Friday Harbor, San Juan Island's major town. 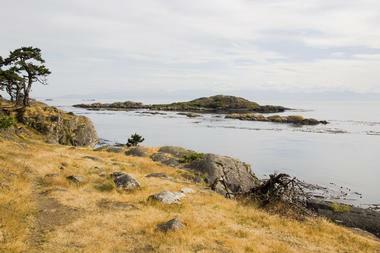 The old landmarks and remnants of British and American camps are now part of the San Juan Island National Historical Park. Just outside Friday Harbor is the University of Washington’s marine research lab and campus, which was established in 1909. Other interesting places to visit are the Whale Museum, the new art museum, the San Juan Community Theatre, and the outdoor sculpture park near Roche Harbor. Lime Kiln Park is the place to sit and watch orcas swim by. 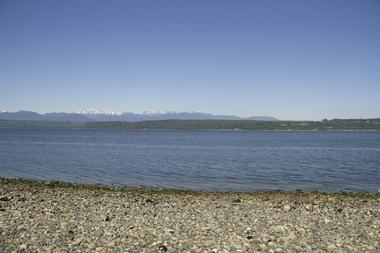 Camano Island is a large island in Puget Sound located between the mainland and Whidbey Island. The island is accessible via the Camano Gateway Bridge and is an unspoiled paradise with rolling hills, a rarely crowded shoreline, a rich array of wildlife in ancient evergreen forests, a big sky with bald eagles, and blue herons strolling along the beach. The island has two state parks: Camano Island State Park, a 134-acre camping park covered in protected forest with a rocky beach, hiking trails, fishing, boating, and scuba diving, and Cama Beach State Park, which has lovely small beach, charming restored cabins, and long trails through the forests. A popular tourist destination, Camano is famous for its numerous festivals, from the Port Susan Snow Goose and Birding Festival in February to the Spring Art Show in June to the Stanwood–Camano Chili & Chowder Cookoff in November. 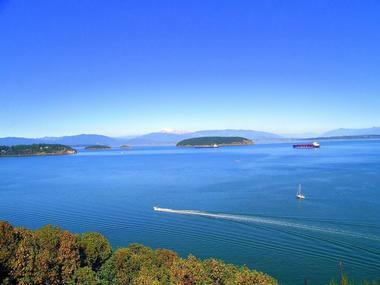 Fidalgo Island is an island in Skagit County, Washington, about 60 miles from Seattle. The island is separated from the mainland by the Swinomish Channel and connected by the iconic Rainbow Bridge. Deception Pass separates it from Whidbey Island. The main city on the island is Anacortes, called the "gateway to the San Juans.” Anacortes has a number of popular annual events such as the Spring Wine Festival in April and the Anacortes Waterfront Festival in June. Anacortes is also gaining a reputation for its art galleries, which feature works of local and well-established artists. Washington Park is a 220-acre park in the heart of the city with lovely hiking and biking trails. Part of the famous Deception Pass State Park is located at the south end of Fidalgo, a hikers’ heaven with old-growth forests, beautiful beaches, rich wildlife, and 38 miles of hiking trails. Fox Island is located just off Kitsap Peninsula in the Puget Sound. The island is quiet and fairly rural and is accessible via a bridge near Gig Harbor. It enjoys spectacular views of looming Mount Rainer across Puget Sound, and this lovely lush island is best explored by boat. The view of the iconic Fox Island lighthouse, with Mount Rainer in the background, is picture-perfect. Fox Island Historical Museum, with more than 3,000 artifacts, is a great place to learn about the island’s history as well as that of the people who lived on it. Chapel on Echo Bay, on the edge of the water, is a must-see; this lovely 100-year-old chapel is also a popular venue for romantic weddings. Kopachuck State Park on Henderson Bay is a 109-acre marine park with 5,600 feet of shoreline. Fox Island Sand Spit is a public camping park, while the Fox Island Nature Center is a beautiful protected area with deep forest, year-round island streams, and a number of wetlands. Guemes Island is a small island in Skagit County, north of Fidalgo Island and about a 5-minute ferry ride from the town of Anacortes. It is small rural community, and apart the Guemes Island Resort offers limited facilities. 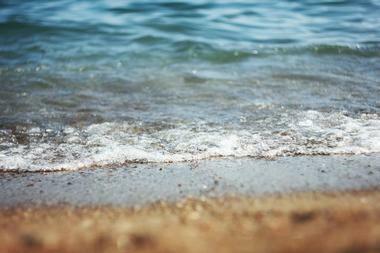 Most beaches are public and so are the boat launches. There is the small Schoolhouse Park in the heart of the island, while Young's Park, on North Beach, is not far from the Guemes Island Resort. There is a beautiful 2.2-mile well-maintained trail up Guemes Mountain, winding through a western red cedar and Douglas-fir forest, moderately difficult, with a few switchbacks and a moderate elevation gain. The trail is surrounded by magnificent nature and some rare native plants, while the views are breathtaking. Harstine Island is located in southern Puget Sound, west of Case Inlet, just under 10 miles from Olympia. 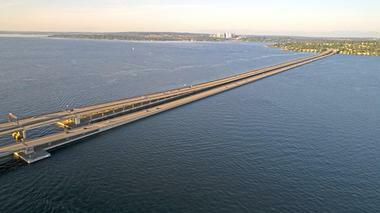 It is easily accessible from the mainland via a bridge near the end of the Kitsap Peninsula. Most of the island is rural, undeveloped, and heavily forested. The best way to explore its shady country lanes is on a bike or by paddling around the island’s gnarly shores in a kayak, a good way to spot seals or whales. Towering evergreens evoke a timeless atmosphere of the world long gone. There are three great parks, including McMicken Island State Park, which has 1,661 feet of shoreline and is known for its serene cove, where you can throw an anchor and relax. It has great hiking trails through a forest full of wildlife. Don’t miss the Wild Felid Advocacy Center, a sanctuary for cats big and small, from abandoned household cats to leopards and cougars. Herron Island is a tiny, about 300-acre island in the southern part of Puget Sound. Most of the island is owned by the HMC corporation, which comprises the property owners, and is accessible by the corporation ferry for the residents and their guests. The corporation owns the North Beach Park with a small boat dock, the undeveloped South Beach, and Goodpastor Park with the adjacent wetlands as well as the roads, fire station, community building, ferry, ferry docks, and water system. The rest of the land is owned by other private owners. With only a few hundred inhabitants, the island is quiet and serene, completely unspoiled, with forested areas and wetlands and trails crossing the island. 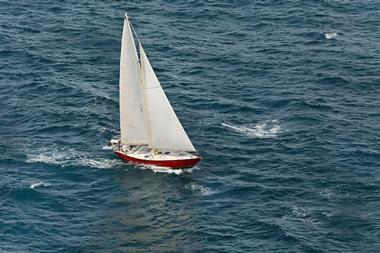 Quiet waters around the island are often visited by passing whales and dolphins. 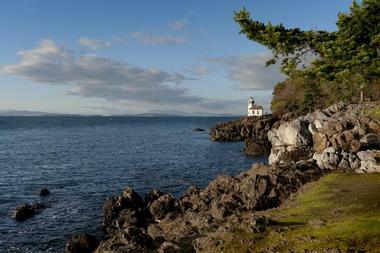 One of the largest San Juan islands, Lopez Island is 15 miles long and has 63 miles of shoreline. It is covered in lush forests and rolling farmlands, deserted beaches and quiet bays, overlooked in the distance by snow-capped Mount Baker. The largest community on the island is Lopez Village, with charming shops and quaint cafes, a library, a historical museum, and a number of art galleries. Scandinavian farmers fist discovered the island in the 1850s, and were later joined by artists attracted by the magnificent nature and relaxed village vibe. The local farmers’ market is a delight with plenty of local produce such as pears, apples, kiwis, and local grapes. There are also llamas and sheep grazing peacefully on the green hills. Lummi Island is quiet and relaxed small island near Bellingham, Washington, accessible by a short ferry ride from Gooseberry Point. This vibrant artist community doubles in size in the summer when Canadians and Americans come to relax. Anywhere you go, the vistas of the Salish Sea are spectacular. There are only two restaurants, one store, a few B&Bs, a post office, a library, an old school, and a church. 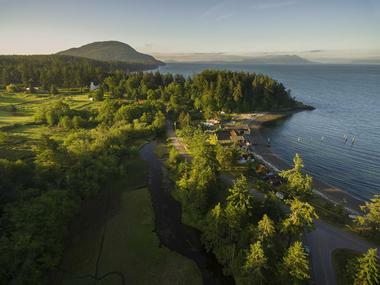 Lummi Island is well known for its reef-net salmon fishery, lively artist population, and wonderful hiking opportunities along quaint, narrow rural roads. A trail up Lummi Mountain is slightly more strenuous and it takes hikers through the lush Baker Preserve to breathtaking views of the San Juan islands. Marrowstone Island, near Fort Flagler, Washington, is a hidden gem, a pastoral oasis with rolling hills covered with ripening strawberries where rugged beaches are dug for clams, artists are finding themselves at home, and everyone who visits is in awe of the snow-covered peaks of the Olympic Mountains. Marrowstone Island was settled by Norwegian immigrants in the 1800s and their descendants are still farming the island’s fertile lands and oyster beds. The main town is Nordland, with a general store, small rustic cabins, a boat dock, and a lovely vineyard that produces its own wine. There is also an art gallery where local artists showcase their works. Former military base Fort Flagler is today a state park, with lovely hiking trails offering spectacular views of Mount Baker, Mount Rainier, and the San Juan Islands. 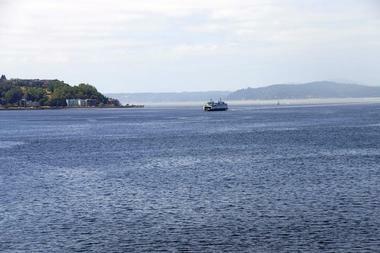 McNeil Island is located in western Puget Sound just west of Steilacoom. The island is best known for the United States Federal Penitentiary, a jail that existed from 1875 under different names until it was closed in 2011. 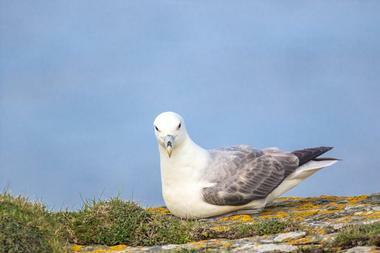 It was the last island prison in the country. Since the closing of the prison, the island has remained the home of the state's main Special Commitment Center (SCC), which indefinitely holds sexually violent predators after they have completed their prison sentences. The island is government-owned. Mercer Island is located on Lake Washington, about halfway between Seattle and Bellevue, and is considered one of Seattle’s most affluent suburbs. The Lacey V. Murrow Memorial Bridge and the Homer M. Hadley Memorial Bridge span Lake Washington and connect the island with Seattle. The city of the same name is a fast-growing commercial center of the island, the place where islanders go shopping, eat in gourmet restaurants, or visit a gym. The island is known for its affluent population with large luxurious homes and mansions, but also for its beautiful parks, which offer spectacular views. There are more than 475 acres of parks, three public beaches, and over 50 miles of hiking trails. Originally privately owned by Seattle millionaire William Pitt Trimble, in 1959 the state of Washington turned the whole of Blake Island into Blake Island Marine State Park. With the views of the Seattle skyline and Olympic mountains and 5 miles of beach, this 475-acre park is a very popular destination for camping, hiking, boating, and enjoying the wilderness. Tillicum Village, located on the northeastern end of the island, exhibits Northwest Coast Indian culture, arts, and food. Argosy Cruises' Tillicum Excursion offers live performances with Northwest Native American storytelling and a locally inspired buffet meal with traditionally prepared fire-roasted fish. There are 7.5 miles of biking trails, 8 miles of hiking trails, and 1,500 feet of moorage for private boats. Puget Island, Washington, is located in the Columbia River, across from Cathlamet, Washington, and is connected to the mainland by the Washington State Highway 409 bridge across the Cathlamet Channel. Puget Island is connected to Oregon, on the other side of the Columbia River, with the ferry landing in Westport, Oregon. Norwegians established the first permanent residence on the island, farming its fertile land and fishing the rich river waters. The island is today known as “Little Norway.” Norwegians built the two Gothic Lutheran churches in 1929. The Two Islands Farm Market is great place to get fresh produce and socialize with the locals. The Svensen Park and Boat Launch is popular with fishermen and very active during the fishing season. A part of Puget Island is protected within the Puget Island Natural Area Preserve. The southernmost island in Puget Sound, Anderson Island is located just south of McNeil Island, close to the Key Peninsula, a part of the Kitsap Peninsula. It is separated from the mainland by Puget Sound and can be reached by a roughly 20-minute ferry ride from Steilacoom, Washington. 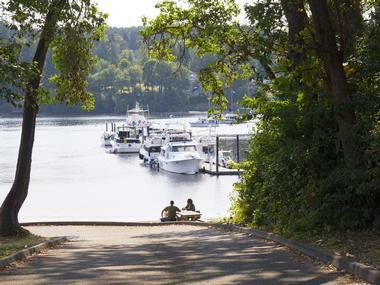 Lushly green and very tranquil, Anderson Island has been a retirement destination since the 1960s. There are three parks on the island, meaning that most of its resources are protected from development. Andy’s Wildlife Park consists of 170 acres of forests, wetlands, and estuary, and there is a 2-mile trail that meanders through the park. Andrew Anderson Marine Park is lushly forested with magnificent ancient Douglas firs and many native plants. The trail ends at the tidal inlet known to be a salmon nursery and a lovely beach. 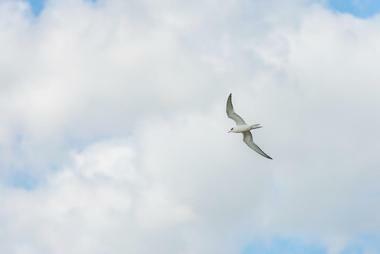 Eagle Island State Park is a remote island off Anderson Island with 2,600 feet of shoreline where seals love to rest, along with many enjoyable trails and camping areas. Shaw Island is the smallest of the San Juan islands, a tiny green jewel, private, quiet, carefully guarded with no development permitted. Just sandy beaches, easy biking and hiking trails through the woods, a quaint general store providing all needs, an old red school, a small island museum, and a little library. The island is shared by reclusive billionaires and Benedictine nuns and the nuns are probably the more hospitable of the two. Stroll or bike through the scenic shorelines at the Shaw County Park or the biological reserve run by the University of Washington. While nuns used to practically run the island, ferry included, until few decades ago, today they running Our Lady of the Rock Benedictine monastery and welcome visitors to their well-run farm. If you want to stay longer, there is a lovely campsite in the woods along the beach with views of the Olympic Mountains. Vashon-Maury Island is located south of Admiralty Inlet and is the largest island in Puget Sound. Until 1916, Vashon Island was separate from Maury Island, but the local owners built an isthmus that today connects the two islands and has the little hamlet of Portage siting on it. 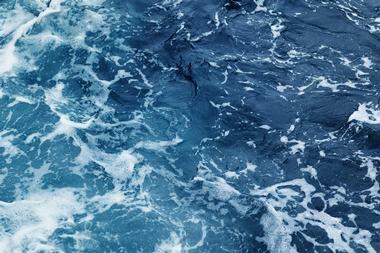 The island is only 13 miles long and 8 miles wide and has 45 miles of shoreline. It is very quiet and rural and is accessible from the mainland only by a short ferry ride from Seattle, Tacoma, or Kitsap County. The island is very popular with tourists, who are attracted not only by the beaches but also by excellent restaurant, quaint accommodation, art galleries, and frequent festivals. Whidbey Island is located in Puget Sound, just north of Seattle, Washington. 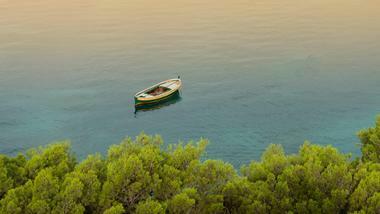 The island is very picturesque and rugged, with miles of beaches, rolling hills, and fertile farmland. Deception Pass State Park, located on the island’s northwest tip, offers fantastic hiking opportunities, with spectacular clifftop views, trails through dense old forests, and crystal-clear freshwater lakes. On the southern part of the island is Fort Casey Historical State Park, a home to a historic gun battery and a lighthouse. The island has several quaint coastal towns. Coupeville, Oak Harbor, and Langley have restaurants, shops, cafes, and art galleries.